While decomposed granite (DG) might not be on your radar, it’s a common material you come across in your garden, in a park, or on a pathway or walking trail through your community. It crunches under your feet at the baseball field. It can can be compacted to create a beautiful, natural surface while remaining firm and permeable, and stabilizing additives can be added to further enhance these valuable qualities. It’s in more places than you think, but after checking out this guide, you might have a few ideas of your own for the broad variety of uses and aesthetics decomposed granite brings to the table. Granite is the most common igneous rock (rocks forming through the cooling and solidification of magma or lava) on Earth. In the case of granite, it originally crystallizes below Earth’s surface where its slow cooling allows large crystals to form. You may have seen granite take shape as some of America’s favorite sights like Yosemite Valley or a few guys on Mount Rushmore. Decomposed granite is the completely natural derivative of granite. When granite erodes and endures weathering over time, it easily starts flaking and crumbling away from its parent source. This decomposed granite crumbles into various sizes of particles and can be further crushed and screened to specific sizes for different project needs. Granite weathers into decomposed granite in part because one of its components, feldspar, chemically weathers into a clay mineral called kaolin, which, when exposed to more water, further deteriorates. Where can you find decomposed granite? Crushed decomposed granite is produced by more than 100 quarries throughout all regions around the United States. Because of the varying levels of chemical composition around the U.S. and Canada, quarries in different regions will produce DG of different colors. In Kafka Granite’s home turf, vibrant reds, browns, and golds are most prominent. Other regions may be known for their tans or greys. Because of the demand for DG in a variety of colors, Kafka Granite also crushes natural stone to mimic the qualities of decomposed granite, and therefore Kafka Granite is able to offer more than 50 different colors—a rare offering by most suppliers. Our natural decomposed granite and crushed stone alternatives are crushed and screened to size and can be used interchangeably for decorative and practical applications. What is decomposed granite used for? Many would assume that granite and all of its derivatives are primarily used for countertops and architecture, but you may be surprised to hear that once granite has been transformed into decomposed granite it’s applications take on a multitude of uses. Despite its name, decomposed granite is still very strong. In fact, DG is harder than marble and the unique composition allows it to compact firmly for patios, ballparks, driveways, pathways and landscapes, or more high-traffic applications such as roads, while yet maintaining drainage characteristics not found in most other hardscape surfaces. Kafka Granite is an industry leader in DG and offers both standard, stabilized, and polymeric wax decomposed granite mixtures. These innovative mixtures are comprised of various colors of granite, quartz, marble and in some cases, recycled materials such as porcelain, kiln slag, copper slag, firebrick, and more. Thanks to the care we give in creating attainable eco-friendly products, Kafka Granite has been able to assist many designers and architects receive LEED and SITES Certifications. 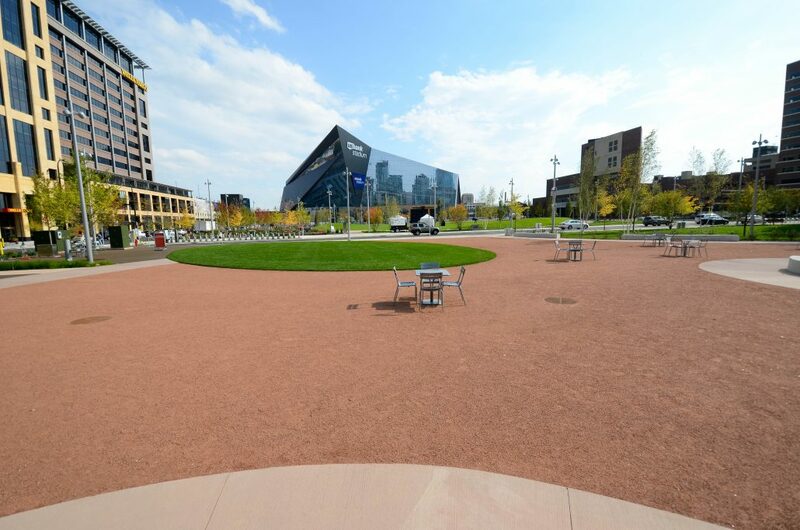 Decomposed granite is a versatile and robust material that can be used in everything from the trails and Erin Hills Golf Course to the Downtown East Commons at the U.S. Bank Stadium. How can you stabilize granite aggregate? Sometimes standard DG just isn’t right for your project. You may need more stability and durability. 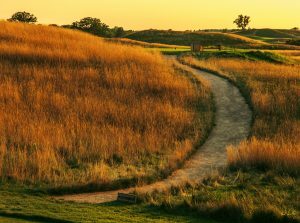 Your pathway might need to be able to withstand heavier traffic, or your ballyard may need the moisture-retaining properties of an organic binder to minimize dust and mud. Kafka offers several crushed granite mixes that have been engineered to support high traffic areas, such as our stabilized and wax polymer pathway mixtures. Whatever the reason, crushed granite can be stabilized with natural binders such as Organic-Lock and Stabilizer Solutions. These binders help create a durable surface that resists the erosive powers of weather or heavy traffic—all while maintaining the natural aesthetic you may have been going for in the first place. This means stabilized decomposed granite is an excellent alternative to obtrusive or less-natural looking asphalt or concrete pathways, driveways, etc, while still remaining permeable. For the highest level of erosion resistance and durability, the Kafka Granite wax polymer pathway mixtures is an optimal solution. This hearty mixture can withstand intense erosion and be laid on the steepest of hills, due to its completely sealed, impermeable surface. 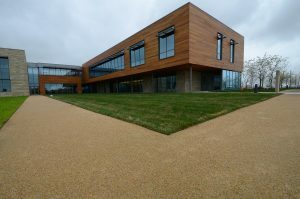 However, this surface yet retains a natural aesthetic and can be easily maintained and manicured overtime, unlike traditional hardscape materials. Where can you buy decomposed granite? Decomposed granite can be purchased in a variety of ways. Depending on the size and scale of your project, we’ll be able to assist you with finding your ideal decomposed granite mixture. It is usually easier for smaller-scaled operations to source our aggregate mixtures from a member of our expansive dealer network. With dealers spread out all over the Midwest, finding a Kafka Granite near your next project is easy. When it comes to large-scale projects, we most commonly assist contractors, architects, and designers by providing direct quotes for their architecturally specified projects. With a versatile portfolio comprising standard, stabilized, and wax polymer pathway mixes, we can help any project find its ideal pathway mixture. When you get in touch directly with Kafka, you’ll be able to speak with one of our crushed granite pros who can help you determine exactly what you need for your specific project. You can also receive samples and ask questions before making a final decision. Stay up to date with Kafka Granite! Be the first to know about our newest products, featured projects, and other newsworthy information. Contact us for more information, to request a quote, or to receive free samples. Loading hours may vary with season. Please call office to confirm loading hours.